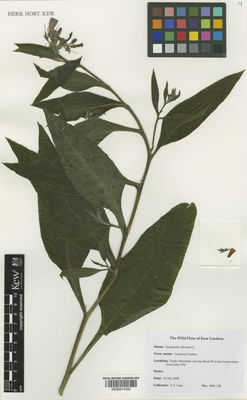 Genus: Symphytum Tourn. ex L.
This species is accepted, and its native range is Europe to W. Siberia. Mirando de Melo, J.I., Taroda Ranga, N. & Cavalheiro, L. (2013). Flora dos Estados de Goiás e Tocantins 43: 1-62. Universidade federal de Goiás. Tarikahya-Hacioglu, B. & Erik, S. (2013). 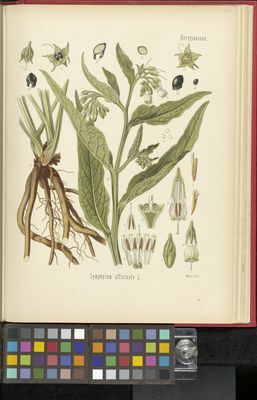 Türkiye'de yetisen Symphytum (Boraginaceae) taksonlarinin revizyonu Ot Sistematik Botanik Dergisi 20(1): 23-74. Yan, X.L. & Ma, J.S. (2011). Nomenclatural notes on alien invasive vascular plants in China Plant Diversity and Resources 33: 132-142.